The Surf Line, as I’ve built it, began in 1997. It’s seen several iterations in the years since then. Originally, it depicted San Diego in 1940-1941, just prior to World War II. 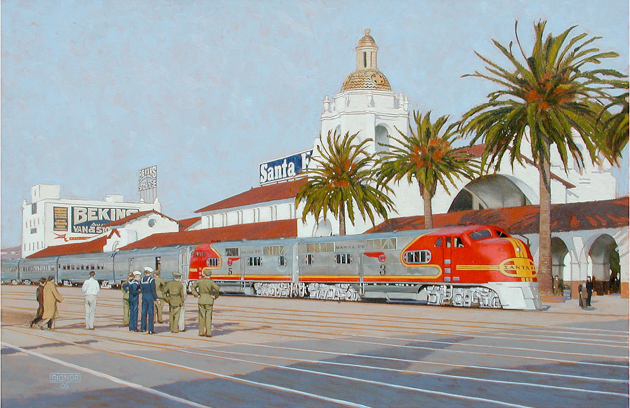 San Diego was going through a boom as the military began to build up and rail traffic was on the increase. Steam was everywhere, save for the Diesel-powered San Diegans. In 2005, I began a rebuild of the layout, moving the modeled era to 1952. By this time, Diesels had taken over and only a couple of steam engines could be found on the Surf Line. I invite you to take a closer look at the prototype and the layout.